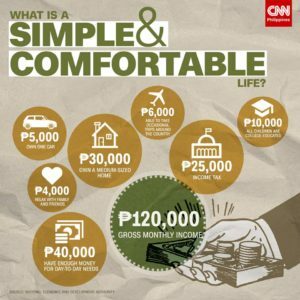 A few days ago, I came across this recent NEDA survey saying that most Filipinos want a simple and comfortable life. What was curious for me is that in the survey, they tried to put a specific amount to what is SIMPLE & COMFORTABLE. Would you like to find out what’s the amount too? Here’s the answer: for a family of four, this means having a monthly gross income of ₱120,000 and enough money for day-to-day needs. You can go to cnn.ph/28ZLOjU to watch the video and learn the rest of the survey. While thinking about it, I remembered another survey a few months back about the HIGHEST PAYING JOBS in the Philippines. I think it was in a Jobstreet survey where they indicated that IT people had the highest paying jobs in the Philippines. Their monthly salaries ranged from P38,000 to P86,550. It does not take a mathematician to figure out that the P86,550 income from the HIGHEST PAYING job, CANNOT cover the P120,000 needed for someone to live a SIMPLE & COMFORTABLE life. One thing is definitely clear from the numbers: everyone needs additional income apart from their jobs to provide a simple and comfortable lifestyle for their families. I’m curious what part-time opportunities have you tried so far to add on to your income from your job? How did it go? What did you learn? I’d like to get to know your stories and experiences. Feel free to email them to me, or comment below. Who knows you may even be featured in my future posts in this blog. Here’s the good news. In my next post, I will be sharing you some ideas I picked up from my good friend Fritz @ Ready To Be Rich on the ways on how you can add another stream of income on top of your job. Watch out for it. Cheers!